Last week, I was dead set on taking my entire family to the local farmers’ market. We decide to go to the one in Pendleton, Indiana, which wasn’t very big, but we still ended up leaving with our hands full. One of my sons, Sage, spotted a pattypan squash and decided he had to have it. He was even going to spend his own allowance on it, but we decided to bite the bullet and buy the $1.00 squash for him. Perhaps, it was the unique shape which caught his eye. It looks like an edible flying saucer. With that in mind, that’s exactly how I decided to roll with it. This squash became Sage’s Saucer (with sausage filling). Sage helped with this recipe. It’s very easy. Be sure to get the sausage cooked ahead of time or use leftover sausage from a different recipe. First thing, is to preheat the oven. Next, slice the pattypan squash in half and remove all the seeds. Once that’s done combine all the other ingredients, except for the oil. I like a toastier filling so I prepare mine as listed below in the instructions and add the filling before the squash is baked, then drizzle olive oil on top, and pop it the oven. I suppose if one initially strives for a softer filling, and later decides that just won’t suffice, broiling the top for a minute or two might bring toastier results, though I haven’t tried that. If you do, keep an eye on it. Broiling is not for those with ADD. (I can say that since ADD runs rampant through my house, but don’t be offended, I wasn’t calling you out). 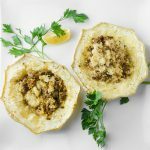 Roasted pattypan squash stuffed with sausage and cheese filling. Preheat oven to 400 F, and wash the squash (that rhymes). If the sausage isn’t cooked, now is the time to get that done. I like using leftover sausage from a previous recipe. Slice the pattypan squash in half, crosswise, so it looks like two halves of a flying saucer. Remove all the seeds from the middle of the squash and place the squash on a baking sheet. In a small bowl, combine the cooked sausage, bread crumbs, cheese, lemon juice, and salt/pepper (I used about a 1/4 tsp of each). In the hole where the seeds were in the squash, fill with the sausage mixture, then drizzle with olive oil. Bake in a preheated oven for 55 minutes or until the squash is tender. Preheat oven to 400 F, and wash the squash (this still rhymes). Drizzle the squash with olive oil and season with salt and pepper. While the squash is baking, in a small bowl, combine the cooked sausage, bread crumbs, cheese, lemon juice, and salt/pepper (I used about a 1/4 tsp of each of the salt/pepper). Once the 40 minutes is up, remove the squash from the oven and scrape the middle of the squash with a fork to loosen it from the sides. Add the loosened squash to the bowl with the sausage mixture and thoroughly combine. ill the empty squash saucer with the sausage mixture, and bake for an additional 15 minutes.